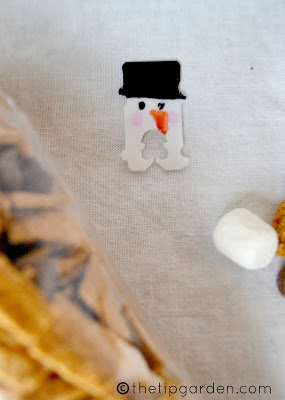 Upcycling plastic bread clip bags, these cute snowman clips are perfect for closing off food gift bags such as those cute cone shaped bags that are perfect for hot cocoa gifts or in my case: Santa's S'more Trail Mix. But even a stack of cookies or candies in a clear cellophane treat bag would be super cute with these snowmen! Ok, so as you can tell, I am no artist! But in gift giving even the simplest gifts can be made to feel extra special, it's all in the packaging and the small touches! These would be so cute at a holiday craft/bake sale or for sending home treats at school. You can make these from either the longer rectangle clips like I did, or the small square ones will work too. I used just good ol' sharpie markers, but acrylic paints will work too! Here's some super cute ones from:diykawaii.wordpress.com/ She talks you through step by step, so even though I just kind of "wing it" with mine, she gives you instructions for creating total cuteness!